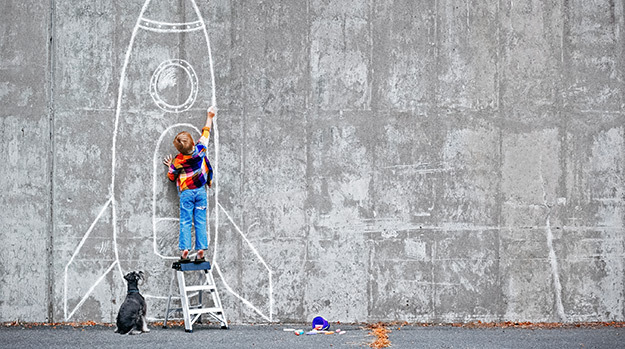 If you understand the importance of playfulness in creativity and innovation, then it becomes easier to make space for it in a busy working day. Many technologists take innovation as a serious business. They push themselves to design more and more advanced solutions, trying to keep ahead of the competition. Firstly, we can recognize that play is not only about fun. It has a serious side. Biologists say that animals play as “training for the unexpected.” The kitten may not yet have met a huge, hungry predator, but it’s fun to pretend you are being chased by one while looking for places to hide. Play fighting with your brothers and sisters prepares your skills for when you need them for real. In the same way, your business may not be facing a crisis yet. The competition is still some way behind you. Your systems are secure and running well. No disasters are interrupting your supply chain or production. But you cannot afford to wait for these things to come true: you must prepare your skills in advance. You need to play. There are numerous ways in which play can be brought into an innovation strategy. I often suggest creative games as part of an ideation workshop, in order to get people in a more relaxed, ingenious mood. Well-known parlor games such as Charades may be enough, or you could try some challenging modern games such as Fluxx. The game should not be overly competitive: the aim is to inspire exuberance and curiosity, not a cuthroat struggle to succeed. Having together, even just for half an hour at the beginning of a workshop, increases empathy and mutuality. This is important and useful as it can help to overcome barriers of shyness and reticence for some participants. At the same time, play can take the edges off some of the tensions that emerge in our social hierarchies: the manager may be in charge in the office, but may well be less agile, less witty and less accomplished trying to mime “Twelve Angry Men” in under a minute. Play can take your current skills - in planning, design and development - to a new level of mastery. You can move on to play games with your current business situation as you model new scenarios. What if we had zero customers, what would our marketing strategy look like? What if we gave the product away for free, how could we make money? If we priced our service 100 times more expensive than today - what would it need to look like to succeed? What if we moved our headquarters to … Peru? The very point is not to be practical - for now - but to spark new ideas that could not emerge in any other way. Play can take your current skills - in planning, design and development - to a new level of mastery. Play can open your eyes from simply being interested in your business to be astonished at the range of possibilities. Play can channel your strength and commitment into ingenuity and profound innovation. And don’t forget - it’s fun too.